On April 20, the Joe Andruzzi Foundation will once again be tackling cancer with each stride when 20 “Team JAF” runners take to the streets of Boston for the 119th Boston Marathon® – all to raise money in support of our mission of providing help, hope and a reason to smile for patients and their families. 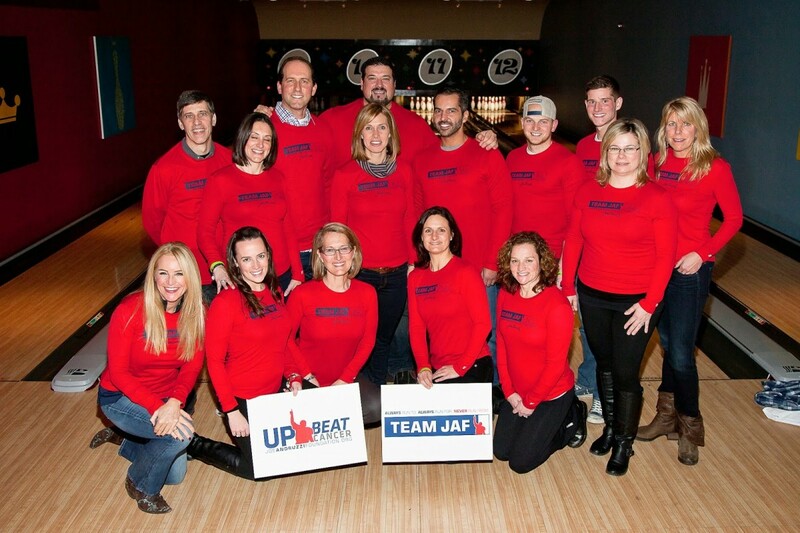 Team JAF runners will also be spreading JAF’s (Up)Beat philosophy, stressing the power and importance of positivity. Today, we kick off our Boston Marathon runner-profile series – giving our supporters a glimpse into Team JAF and what is driving them to cross the finish line on Patriots Day 2015. The 2015 Boston Marathon will be a special day for North Attleboro’s Lisa George. The 26.2 miles awaiting her this spring will no doubt be challenging for the mother of two, but Lisa draws her motivation from places far-removed from the Boylston Street finish line. Cancer has touched Lisa’s life on many fronts, and raising money/helping families battling the disease is what is driving her through recent snowy, sub-zero training runs. A first time marathoner, Lisa is excited to hit the streets of Boston this April to help our cause and spread JAF’s mission, and we can’t wait to cheer her on as she crosses the finish line in April. Click here to help Lisa and other members of Team JAF meet their fundraising goal! Teaming up with JAF has been rewarding. Joe and Jen help so many people whose lives are touched by cancer by either paying their rent or a utility bill. It’s a great cause that I wanted to be a part of. What is your marathon fundraising goal, and how do you plan on reaching it? $7,000.00 – I did a letter campaign. I will be doing a fun night out in North Attleboro and a shopping party at a local boutique. I have done three halves, but no full marathons. This will be my first – very exciting! It’s going great. I have some friends running and they have been a tremendous help pushing me to meet my goals. I’m at mile 16. I do weights on Monday, circuit training Tuesdays and Thursdays and running 5-8 miles on Wednesdays. On Fridays I do arc trainer and upper body weights. Sunday is a day of rest. The people around me are very good at getting me going, and when I get really tired I envision my friend, Carolina, waiting for me at the finish line. It makes me happy to know I can do this for her. Do you have a “theme song” and – if so – why is it YOUR song? The Climb, by Miley Cirus. I don’t love her music, but love the lyrics to that song – because life is a climb! What do you do to stay upbeat and motivated while training? Being with my friends and listening to good music. I try to enjoy the scenery too, but this snow is getting old! What would surprise the inexperienced about marathon training? I think people feel it’s really hard to run 26.2 miles, but I’m not sold on that. I feel like if I can do it, anybody can – you just have to set your mind to it. It is! I have experienced it and hope it comes out on Marathon Monday! What’s the best training meal or snack? I like to get up and have my coffee, (I can’t run without it). Then I eat my Kashi cereal and a banana. I like to drink coconut water mixed with regular water on my runs and I like the energy jellybeans. It all seems to be working! Anything else you’d like our supporters to know about you?